Below is the basic specs. So much has been done, I am probably missing a few things. Complete 04 STI 6spd conversion!! I’m sure that I am forgetting a bunch. I’ll update when I remember. I have a STI steering rack with whiteline bushings that could be installed if full price is offered. 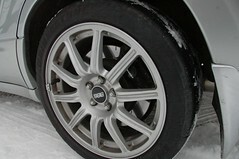 I also have a new set of Goodyear f1 Asymmetric that could be put on at full offer. Most of the original engine parts are available with full offer as well. 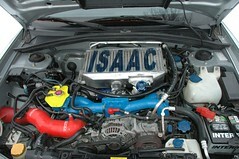 The 6-speed conversion was done professionally by Juston if SixStar Service in Atlanta (previous owner). The car has never seen a salty road. I have kept it extremely clean as it is my baby! 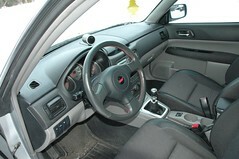 I put protectant on all interior and exterior hard panels / vinyl several times a year. I vacuumed the car almost every week during the summer. 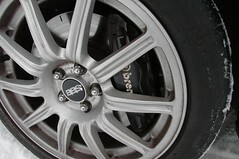 The pictures show it to be a bit dirty because it has been too cold to clean or wash for over a month now! The roads are salty so I won’t drive it to town to get it cleaned. I hear we will get up to 40 this week, so I’ll do a thorough detail job on it then. Oil has always been changed every 3-5k with Rotella 5w-40 full synthetic. Please ask any questions you may have! 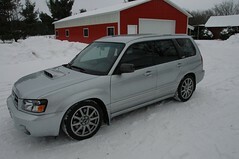 Good time to jump on a rare 6speed Forester that is in excellent condition! Car is in Eau Claire WI, but I can pick anyone up from the Minneapolis / Saint Paul Airport. Delivery is an option too. Trade would be for a good mpg car like mid 2000's civic, corolla, matrix, vibe, or focus. Nothing interesting, but my family comes first. 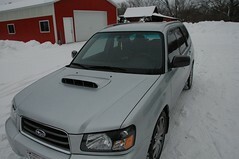 posted on the forester forum some questions. I am interested. what was the tune? what kind of numbers does the car make? Bummp for a great car! TOo bad you are moving on man, but helluva nice build and excellent price considering you have probably twice that much in it. Whoever gets this, will be very very pleased. These things are a LOT of fun and very very low key. Bump for a sweet sleepy foz. I use to have an STI and hated the attention. 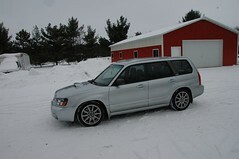 Now my foz is setup it's great to suprise people. I've had some interest via PM's but no purchase as of yet. The Rocket wagon is still available! 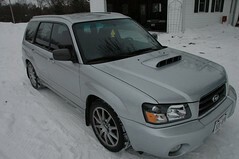 This is one badass forester. Props, though i think your crazy for selling.